Buried inside the bad news is a glimmer of what could be considered hope for Pakistan's grade 5 and 8 students outperforming their counterparts in India. 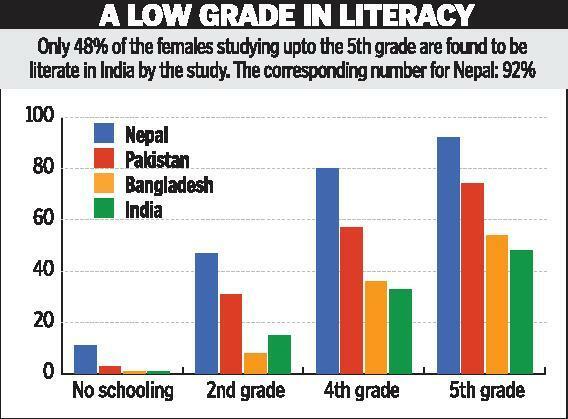 While 72% of Pakistan's 8th graders can do simple division, the comparable figure for Indian 8th graders is just 57%. Among 5th graders, 63% of Pakistanis and 73% of Indians CAN NOT divide a 3 digit number by a single digit number, according to the World Bank report titled "Student Learning in South Asia: Challenges, Opportunities, and Policy Priorities". The performance edge of Pakistani kids over their Indian counterparts is particularly noticeable in rural areas. 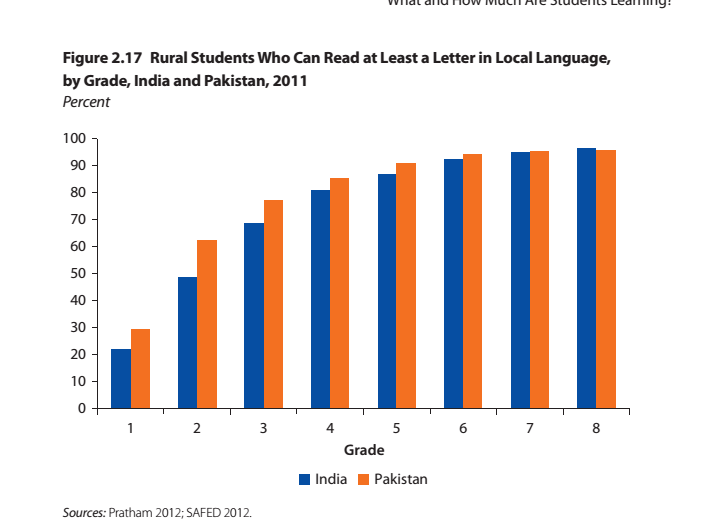 The report also shows that Pakistani children do better than Indian children in reading ability. The report relies upon numerous sources of data, among them key government data (such as Bangladesh’s Directorate of Primary Education; India’s National Sample Survey, District Information System of Education, and National Council of Education Research and Training Assessment; and Pakistan’s National Education Assessment System); data from nongovernmental entities (such as Pakistan’s Annual Status of Education Report, India’s Student Learning Study, and its Annual Status of Education Report); international agencies (such as the Organisation for Economic Co-operation and Development [OECD] Programme for International Student Assessment [PISA] 2009+ for India; the World Bank Secondary Education Quality and Access Enhancement Project in Bangladesh); and qualitative studies undertaken for the report (such as examining decentralization reforms in Sri Lanka and Pakistan). The study also uses the World Bank Systems Approach for Better Education Results (SABER) framework to examine issues related to ECD, education finance, assessment systems, and teacher policies. I hope that this report serves as a wake-up call for political leaders and policymakers in Pakistan to redouble their efforts with significant additional resource allocations for nutrition, education and healthcare. Who's Better for Pakistan Human Development? I am not sure what you are trying to convey by your post. I hope you are not trying to say Indians are not as intelligent. That would be ill advised and Hitleresque. I am 50 and I still have trouble with maths and around 5th STD I was already thinking about the ARTS track. Our school provided three tracks, Science, Commerce and Arts beginning the 6th grade. I work for a major news magazine which has world-wide circulation both in print and on-line. ^^RH: "I hope that this report serves as a wake-up call for political leaders and policymakers in Pakistan to redouble their efforts..."
You just made the age-old mistake of saying that we are doing better than India. Whenever that happens, our elite in Islamabad just rest on their laurels and will make no extra effort. You see, our government always tracks India. If the Indians are doing better than we are in some area, only then GOP will redouble their efforts to 'catch up' in that area. On the other hand, if we are doing better than India in some area, then GOP people will just congratulate each other and not make any major additional effort in that area. Unfortunately, we never compare ourselves to Korea or Singapore. We always use India as our yardstick and so we aim very low. Since we aim low, we achieve low. This is the tragedy of our intellectual and emotional connection to the mess that is Soviet-inspired India. This is the problem. Scientific thinking is not about maths as a subject, but as a concept. While i agree that indians need to improve their math skills, i think division and simple arithmetic is a poor indicator. You have calculators and computers to replace human intelligence to be wasted on such mundane things. I think Pakistan would do well to teach children to use concepts like application of maths into science and vice versa. To start with the concepts of Zero and Infinity are likely to provide good foundation. Human kind can excel only by innovation. As an Indian i would love to see pakistani children being awarded the noble prize. Children are our future and we have to teach them to compete with themselves rather than others. The only people who dont believe this are the politicians who are interested only in their gains. They deprieve the children of scientific thinking for political gains. I only hope voices like yours make people understand that there is hope until you give up. So Buddist Majority Srilank is ahead of Muslim Majority Pakistan and Hindu Majority India in most indicators,even more impressive since they had been in civil war with Indian-supported Tamil-Hindu terrorist for decades.My hats off to Srilanka, smart and determined people. That's what maths is, describing knowledge in numbers/ numerical / empirical form. If your hindu ego was not enormous, you would have made the connection and be better at maths ;). @pacman: but isnt that what i said. I am sorry if i have sounded egoistic or if have seemed to impose hinduism as superior to any faith. I intended neither. I found this subject addressed some really core issues about education and that is why posted my views. My main worry is that children like my daughter who is in class 2 is thought to do things that calculators can do. They are made into human calculators. Can Humanity progress by using intelligence on mundane arithmetic problems. To put it in a different way, maths can only help you if you know how to express a problem mathematically. once you do this, it is a mechanical process to solve it.The the intelligence comes in only in interpreting those numbers as a solution to the problem. Maths students are taughtto solve Differentiation, integration, matrix problems and not where and how it is applied even in class 10. @pacman: Manjul Bhargava had the following to say. How important, in your opinion, is mathematics in Indian culture? Mathematics and mathematical thinking have been an important aspect of Indian culture for a long time. From ancient philosophical verses like "Poornasya poornamaadaaya poornamevaavashishyate" (Infinity minus infinity can still be infinity) that reflect mathematical thinking, to the inherently mathematical structure of the alphabets and phonetics of Indian languages, to the discovery of zero and negative numbers, combinatorics, trigonometry, calculus, and more - so much mathematics has been discovered for ages in a way that is deeply intertwined in Indian culture. There is not need to compare to India to prove that pakistan is better. Being an Indian, don't know to what end it serves. There is no doubt that there are lot of areas in which India is lagging and has to improve. However it will be better for pakistan to look inward if it really wants to improve. I also noticed that people who get very patriotic have migrated to a developed country and have decided to live their from now onwards. Patriotism means also living in their own country thick and thin and being part of the solution. It was a historic day for Pakistan scrabble contingent taking part in the 6th Sri Lanka Interna­tional Scrabble Champion­ship when its youngest member, nine-year old Hasham Hadi Khan, created a new world record by scoring an eye-popping 878 points against Matheesha De Silva of Sri Lanka. After reading this article, it seems to me india is far ahead of pakistan in the field of education. But I don't expect the author to understand why. In 2015, 20 per cent of children were reported to be out-of-school. That number has decreased as compared to previous year, which had over 21 per cent children out-of-school. Only 49 per cent of boys in grade five were able to do grade two level subtraction as compared to 41 per cent of girls in grade five. Some 76 per cent children between the ages of six and 16 were enrolled in public schools in 2015, while last year the number was 70 per cent. According to the report, student competencies in learning English, arithmetic, and language have also improved. The ASER Survey also has identified that boys are outperforming girls in literacy and numeric skills in rural Pakistan. As many as 49 per cent of boys were able to read at least a few sentences in Urdu/Sindhi/Pashto as compared to 42 per cent of the girls. For Arithmetic, 49 per cent of Class-V boys were able to do second grade level subtraction as compared to only 41 per cent Class V girls. In addition to the assessment of children, the report also highlights school functioning across every district in Pakistan. The ASER rural survey informs that overall teachers’ attendance in government schools stood at 89 per cent as compared to 91 per cent in private schools on the day of the survey. The reverse is the case for MA/MSC or postgraduate qualifications, whereby larger percentage of public sector teachers has a higher qualification than private sector counterparts. The trends in multi-grade teaching across schools are also mixed. ASER 2015 National rural findings have found 49 per cent of government and 29 per cent of private schools are imparting multi-grade teaching at the second grade level. On the contrary, at the eighth grade level, multi-grade teaching is more prevalent in the private sector at 24 per cent as compared to 16 per cent in government schools. Despite of the fact that only two per cent private primary schools receive funds from the government (as compared to 29 per cent public primary schools), the private sector has been reported to be better at school facilities. For example, 65 per cent of private primary schools have boundary-walls as compared to 63 per cent government primary schools. Similarly, about the availability of functional toilets, it has been found that the facility was still not available in 48 per cent public and 22 per cent private primary schools in rural Pakistan. ASER has undoubtedly played a unique role in informing the public, inspiring a national discourse and initiate demand for policy and action leading to a transformation from the bottom-up. “They have more experience,” said Fazlullah Pechucho, the Education Secretary in the Sindh province. He said he’s eager to partner. “A lot of elements are being executed with the EMOS, education management organizers, who are the private partners,” he said. Groups like TCF are also excited because they see a faster route to improve both the quality and access to education in Pakistan, a country with a booming population and a dismal public education system. TCF’s strategic director said that adopting a public school and revamping the building saves them time and money, instead of building a new brick-and-mortar campus from scratch. That’s why there’s another strategy at play at the Fatimah Jinnah Government School in Karachi. Here seventh grade girls compete in dodge ball in the courtyard. The Zindagi Trust adopted the girls-only school nine years ago. It offers chess, soccer, a library and art classes. The trust has invested almost 100 million Pakistani rupees in the school, including upgrades to the campus so drinking water didn’t mix with sewage lines. The trust’s director Shehzad Roy calls it a success for other reasons. “The most important thing why we’re turning around government schools is (to) change the system,” he said. Roy is a Pakistani pop singer turned activist. He said that the campus acts as a model to change education laws. So far, he counts half a dozen reforms. They include a ban on corporal punishment and allowing non-government textbooks in the classroom. “And as an institution yes, the school is doing really well. But more importantly, are we impacting the system or not,” Roy said. A number of programs have explored using vouchers or other government subsidies to enable more children to attend private schools. There is good evidence that these interventions are effective. For instance, a recent randomized trial in India found that children provided with vouchers made greater progress in literacy and math than other children. 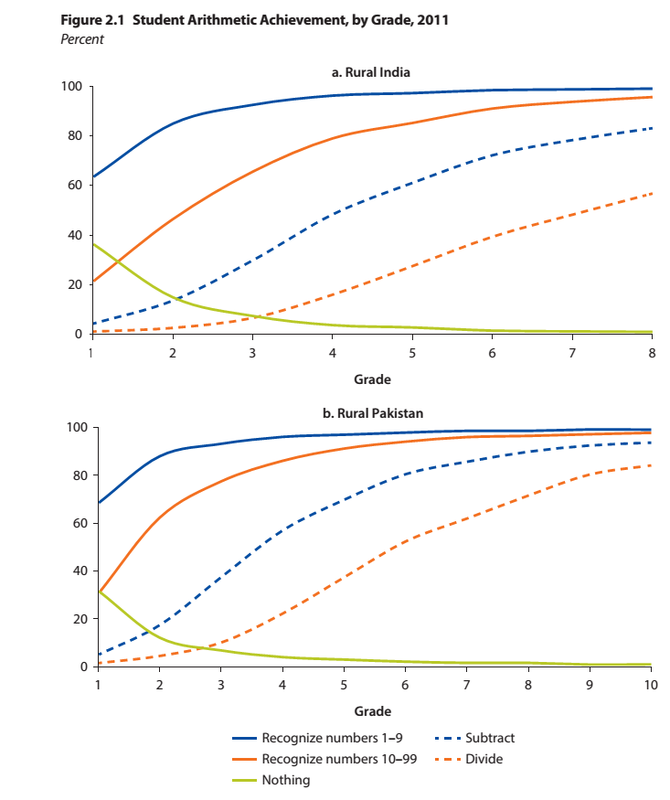 A similar evaluation of a randomized voucher program in Sindh, Pakistan, found that enrolment rates in villages targeted by the program increased by 30%, along with increases in learning, gender equity, and school facilities. More importantly, vouchers can be taken to scale. With 1.4 million children, the Punjab Education Foundation already funds the education of more children than the world’s 30 smallest countries combined (and more children than Austria, Bulgaria, Denmark, Estonia, Hungary, Mongolia and New Zealand). As is the case with most low-cost private schools, it does so at a lower cost per student than the government system. In Chile, vouchers fund more than 50% of children in school. Hong Kong, one of the world’s best performing (and most equitable) school systems, effectively uses a voucher style model to fund around 90% of children to attend privately owned schools (like the Punjab Education Foundation, parents in generally cannot top-up the value of the voucher). Voucher models have also been taken to scale in India, the Philippines and Uganda. Despite that, vouchers have some serious limitations, which, at a minimum, mean that they need to be implemented carefully to have impact. First, while learning levels in low-cost private schools are generally higher than those in government schools, they are not that much higher. Many voucher systems in the developing world (and low-cost private schools more broadly) still leave large numbers of children not learning. With good training, assessment and other interventions, this learning challenge can be addressed. This means that a voucher system has to be one part of a broader reform agenda, not a substitute for it. Second, there is a risk of duplication of resources. In many cases, the government ends up funding competing schools, or continuing to fund empty government schools while at the same time paying for a private school next door. Proponents argue that this is a better situation than children being in government schools and not learning. Nonetheless, it raises serious questions about resources in otherwise resource constrained systems. The best voucher systems attempt to target the most vulnerable or underserved areas, but this is difficult to affect in practice. Third, vouchers, and market-based schooling models in general, have a tendency towards inequality. In Chile, vouchers have benefited students from better-off families more than those from less-well-off families. Good design of the vouchers can ensure that they benefit those who need them most, but this is not guaranteed from the outset. Fourth, as long as public schools are the dominant provider, a voucher program may prove a distraction from the main task of improving the public school system. Many opponents of vouchers argue that political and financial capital would be better deployed improving the public school system. The best reforms combine both approaches, though were financial and political capital are limited, this can be difficult. Finally, as voucher systems scale, they begin to become subject to the same political economy challenges which are often the source of problems in the public school system. Good governance structures can mitigate this, but ultimately, as voucher programs scale, they will become further enmeshed in the political and bureaucratic structures which dominate the school system. Authority over education is devolved to Pakistan’s four provinces, and Punjab’s energetic chief minister, Shahbaz Sharif, the brother of the prime minister, Nawaz, has decreed that the government will not build any of the new schools needed to achieve its 100% enrolment target for school-age children by 2018. Instead money is being funnelled to the private sector via the Punjab Education Foundation (PEF), an independent body with a focus on extremely poor families. Crucially, the province is also improving oversight and working out how to inform parents about standards. It has dispatched 1,000 inspectors armed with tablet computers to conduct basic checks on whether schools are operating and staff and children are turning up. They have begun quizzing teachers, using questions from the exams they are meant to be teaching their pupils to pass. The early results, says one official grimly, are “not good”. In a joint study by the World Bank, Harvard University and Punjab’s government, parents in some villages were given report cards showing the test scores of their children and the average for schools nearby, both public and private. A year later participating villages had more children in school and their test scores in maths, English and Urdu were higher than in comparable villages where the cards were not distributed. The scheme was very cheap, and the improvement in results larger than that from some much pricier interventions, such as paying parents to send their children to school. PEF now educates 2m of Punjab’s 25m children, a share likely to grow by another million by 2018. Meanwhile the number of state schools has fallen by around 2,000 as some have been merged and others closed. Such a wholesale shift to private-sector provision would create a storm of protest in Britain, whose Department for International Development is backing Punjab’s reforms. But there are few signs of anxiety in a country where many parents aspire to send their children to a private school and the country’s recent Nobel laureate, the education activist Malala Yousafzai, is the daughter of a private-school owner. So-called low-cost private schools are a growing and increasingly popular option in poor countries. These private schools usually spend less per student than government-run schools, holding down costs by paying their teachers lower salaries than in the government system. Although the teachers often are not as formally qualified as teachers in the government schools, students in these private schools tend to do as well or better than their counterparts in the other schools. One question is how to encourage these schools to expand beyond primary education, and how to encourage them to make further investments in the education they offer. This evaluation of a new financing mechanism for low-cost private schools in Pakistan will help policymakers understand their options for supporting these schools, allowing them to harness the power of the market rather than relying on greater public subsidies to the private sector. Since 1980, the number of private schools in Pakistan has grown from about 3,000 to about 45,000. Nearly one-third of all primary school children in Pakistan country attend private schools, covering all income spectrums. A 2001 survey showed that about one in five of Pakistan’s poorest families sends their children to private village schools. UNESCO and World Bank data from 2012 shows Pakistan spends 6% of GDP on education---2% public and 4% private spending as percentage of GDP, according to the Economist Magazine. UNESCO and Word Bank data from 2013 shows that 46% of Pakistani kids and 32% of Indian kids reached expected standard of reading after 4 years of school, according to the Economist Magazine.